Nursing clothing should be designed in a way that provides comfort, discretion and is easy to use giving security to both a mother and a baby. But it can also be ideally fitted to your figure and highlight your beauty. Our company tries to find the best maternity and nursing clothes, as we believe in the highest quality for a fair price. As you can see below, our nursing tops, tunics and dresses mix simplicity with convenience and style. They are easy to use both at home and in public and provide enough coverage and sense of safeness for you and your lovely child. Nursing Clothing There are 362 products. Pregnancy and Nursing Cardigan 9005 Dark Pink Look stunning and feel good in this fabulous maternity and nursing cardigan. Designed for mums-to-be to keep their bump warm during cold days. Two button fastening, you can wear it with long or 3/4 sleeves. Stylish, modern and functional design. Pregnancy and Nursing Cardigan 9005 Black Look stunning and feel good in this fabulous maternity and nursing cardigan. Designed for mums-to-be to keep their bump warm during cold days. Two button fastening, you can wear it with long or 3/4 sleeves. Stylish, modern and functional design. Pregnancy and Nursing Cardigan 9005 Navy Look stunning and feel good in this fabulous maternity and nursing cardigan. Designed for mums-to-be to keep their bump warm during cold days. Two button fastening, you can wear it with long or 3/4 sleeves. Stylish, modern and functional design. Pregnancy and Nursing Cardigan 9005 Light Gray Look stunning and feel good in this fabulous maternity and nursing cardigan. Designed for mums-to-be to keep their bump warm during cold days. Two button fastening, you can wear it with long or 3/4 sleeves. Stylish, modern and functional design. Pregnancy and Nursing Cardigan 9005 Dark Gray Look stunning and feel good in this fabulous maternity and nursing cardigan. Designed for mums-to-be to keep their bump warm during cold days. Two button fastening, you can wear it with long or 3/4 sleeves. Stylish, modern and functional design. Lovely 2in1 Maternity and Nursing 3/4 Sleeved Wrap Top 7035 Maintain your pre-bump style throughout your pregnancy with our comfortable and affordable 2in1 maternity and nursing wrap top. This 3/4 sleeved top tunic with inner fabric in the neckline has been designed by Purpless to give you comfort and style during your pregnancy and whilst breastfeeding. 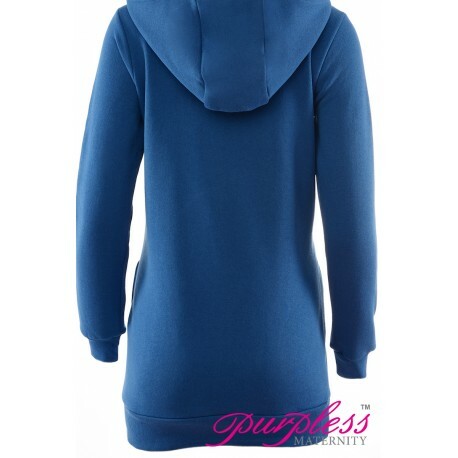 Purpless Maternity 2in1 Pregnancy and Discreet Nursing Hoodie with Zips B9052 Maintain your pre-bump style throughout your pregnancy and breastfeeding with our fashionable and affordable 2in1 maternity and nursing hoodie. This warm, long sleeved 2in1 hoodie has been designed by Purpless to give you comfort and style during your pregnancy and breastfeeding. 2in1 Pregnancy and Nursing Skater Dress 7240 Flatter your baby bump with our new 2in1 pregnancy & nursing skater dress. The dress is designed to fit your growing bump with inner layer of fabric in the wrap front neckline style to allow discrete breastfeeding. The comfort of 3/4 sleeves and A-line dress shape give you stylish and very feminine look.